Abcom has recently made available to our LabourGuard Timeclock users an optional feature that restricts an employee’s ability to clock on too early for scheduled shifts. Our optional Schedule to Timeclock feature exports rostered* shifts for the current day to the timeclock. All scheduled start times are retained within the LabourGuard system and ensure that staff can only clock on at the precise time the roster specifies. If you need to start an employee early or are using non-rostered staff members to fill a shift, then the easy to use “Manager’s Authorisation” function can be implemented. If you have a large number of staff, the implications of those often difficult-to-control early clock-ons can run into thousands of dollars over the course of a year. 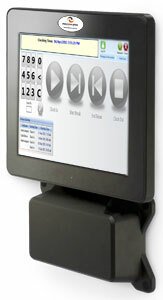 Contact Abcom to have this feature added to your LabourGuard Timeclock. *Abcom eProphet.NET Scheduling application must be used for this function to become operative.